Chelsea interim manager Rafael Benitez ended a turbulent week with the satisfaction of victory as West Bromwich Albion were beaten at Stamford Bridge. Benitez's strained relationship with Chelsea's supporters appeared to reach breaking point after he publicly rounded on those who had been criticising him after Wednesday's 2-0 FA Cup fifth-round win at Middlesbrough. The Spaniard insisted he will stay in charge until the end of his contract in May despite describing the decision to hand him his interim title as "a massive mistake" - and Demba Ba's first-half goal offered some relief by putting Chelsea back in third place in the Premier League. 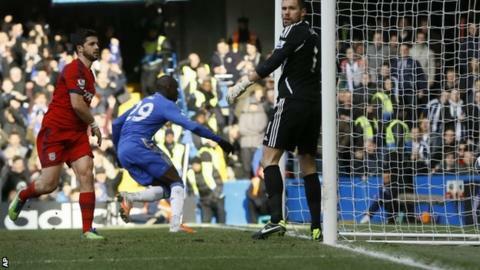 Despite fears Benitez could be the subject of increased hostility following his outburst, the atmosphere inside Stamford Bridge was relatively calm as Chelsea secured a win that was more convincing than the narrow scoreline suggested. Chelsea's fans still made their feelings towards Benitez clear with the familiar chants and banners unflatteringly labelling him "The Interim One" in a clear reference to "The Special One" Jose Mourinho, whose name echoed around Stamford Bridge in the second half, with boos for the Spaniard following seconds later. The win will do nothing to transform Benitez's standing in the eyes of many Chelsea supporters but it was a win that keeps him on course for his target of ensuring they have a place in next season's Champions League. Oscar should have added to Ba's goal but was out of luck while West Brom only threatened late on as keeper Petr Cech saved from substitute Peter Odemwingie and turned away a deflection from his own defender Cesar Azpilicueta. Benitez arrived virtually unnoticed in his technical area before kick-off and while he was the target of some chants throughout the first half - and jeers when he picked up the ball to speed up play - the atmosphere never rose to anything approaching serious hostility. The mood was helped by an impressive first 45 minutes from Chelsea as Benitez kept captain John Terry and striker Fernando Torres on the substitutes' bench. Oscar should have given Chelsea the lead in the third minute but his poor finish from only eight yards allowed West Brom keeper Ben Foster - watched by England manager Roy Hodgson after ending his self-imposed exile from international football - to save. West Brom barely registered as an attacking force until the last 10 minutes, although Cech was forced to turn Steven Reid's long-range free-kick over the top. Chelsea finally got the lead they deserved in the 28th minute. Foster had clawed away David Luiz's free-kick but, from the resulting corner, he was powerless to stop Ba scoring from close in after the Brazilian defender headed Oscar's cross into his path. The second half saw the Baggies enjoy more possession without a cutting edge, despite the introduction of Odemwingie in place of Marc-Antoine Fortune just after the hour. Oscar had worked plenty of shooting opportunities but he was once more thwarted by Foster with 13 minutes left when the keeper saved well from his low shot after Ba's header down. The youngster was undeterred and brought another fine save from Foster moments later. Odemwingie almost provided the equaliser manager Steve Clarke needed as West Brom finally caused some anxiety late on. Cech turned his free-kick over the top then showed quick reflexes to turn away a header from his own defender Azpilicueta. Given that encouragement, keeper Foster joined the attack for a stoppage-time corner but Chelsea came through and Benitez will hope some focus now returns to the football at this chaotic club. "Ben plays like that week in, week out. He's probably made Roy [Hodgson, England boss] happy because he's made himself available for selection and it gives Roy a nice problem. "The Peter Odemwingie saga for us is over. It's finished. He's a key member of our squad and he's got a big part to play for the rest of the season. "We stayed in the game until the last minute but couldn't quite get the clear-cut chance that would've got us a point."